Millions of people visit Queensland’s Gold Coast for thousands of different reasons. Some come for the day, while others stay for weeks. But what they all have in common is that they’re looking for the best accommodation they can afford. There’s no shortage of Gold Coast accommodation apartments, so how do you know if you are getting a good deal? And what should you be looking for in a great resort? When we hear the word, ‘luxury’, we always think expensive – but that’s not necessarily the case when it comes to Gold Coast luxury accommodation. Of course, if you choose to stay somewhere like the Palazzo Versace, you can expect both an exceptional level of service – and a very big price tag! However, it’s possible to experience some of the Gold Coast’s best accommodation at a great price when you book online. And this is a great time of year to grab a hot deal. One of the first things to consider when booking is location. 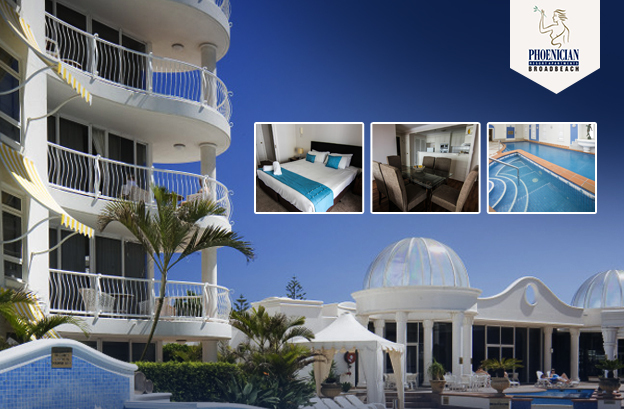 And when you choose Gold Coast accommodation in Broadbeach, you’re definitely onto a winner. This lush and leafy suburb has not one but two fabulous beaches, along with beautiful parks, fabulous shopping and an amazing array of eateries. Whether you’re driving yourself, or coming by public transport, accessibility is crucial – and you’ll get that, too, in Broadbeach. In fact, Broadbeach is a key location for business travellers for that very reason, along with its proximity to the Gold Coast Convention Centre. Another important point to check when booking is exactly what you’re getting for your money. Taking the average hotel room rate as your basis, you’ll be very pleasantly surprised at how much bang for your buck you get in a resort apartment. Luxury resorts, such as Peppers, the Phoenician Resort, and Aruba Surf Resort, give you plenty of room to spread out. You don’t just get a bedroom, and your own bathroom, of course, but a living area, kitchen, balcony, and more. And when we say kitchen, we don’t mean the kettle and microwave you get in a motel! At the Phoenician Resort, for example, you get a fully equipped kitchen, with European appliances. Despite the fact that you are so close to the beach, you should also expect some top notch resort facilities. At this time of year, you’ll want to see a heated indoor pool on the list, as well as spas, saunas, gyms, and so on. And what about parking and security? With everything you need within walking distance of your resort, you won’t be using your car much. So make sure the resort you choose has secure, undercover parking. A good security system on your apartment is an added bonus. And finally, if you’re planning a break over the coming months, expect and ask for a great deal on price. Tick all those boxes and you’ll have found the perfect resort.